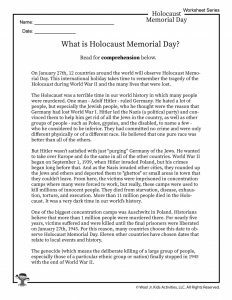 What is International Holocaust Remembrance Day? On January 27th, 12 countries around the world will observe International Holocaust Remembrance Day, also known as Holocaust Memorial Day. This international holiday takes time to remember the tragedy of the Holocaust during World War II and the many lives that were lost. The Holocaust was a terrible time in our world history in which many people were murdered. One man – Adolf Hitler – ruled Germany. He hated a lot of people, but especially the Jewish people, who he thought were the reason that Germany had lost World War I. Hitler led the Nazis (a political party) and convinced them to help him get rid of all the Jews in the country, as well as other groups of people – such as Poles, gypsies, and the disabled, to name a few – who he considered to be inferior. They had committed no crime and were only different physically or of a different race. He believed that one pure race was better than all of the others. But Hitler wasn’t satisfied with just “purging” Germany of the Jews. He wanted to take over Europe and do the same in all of the other countries. World War II began on September 1, 1939, when Hitler invaded Poland, but his crimes began long before that. And as the Nazis invaded other cities, they rounded up the Jews and others and deported them to “ghettos” or small areas in town that they couldn’t leave. From here, the victims were imprisoned in concentration camps where many were forced to work, but really, these camps were used to kill millions of innocent people. They died from starvation, disease, exhaustion, torture, and execution. More than 11 million people died in the Holocaust. It was a very dark time in our world’s history. One of the biggest concentration camps was Auschwitz in Poland. Historians believe that more than 1 million people were murdered there. For nearly five years, victims suffered and were killed until the final prisoners were liberated on January 27th, 1945. For this reason, many countries choose this date to observe Holocaust Memorial Day. Eleven other countries have chosen dates that relate to local events and history. The genocide (which means the deliberate killing of a large group of people, especially those of a particular ethnic group or nation) finally stopped in 1945 with the end of World War II. 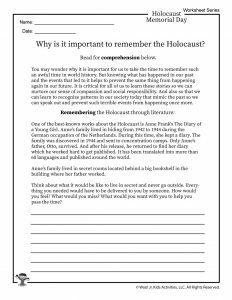 Why is it important for us to remember the Holocaust? You may wonder why it is important for us to take the time to remember such an awful time in world history. But knowing what has happened in our past and the events that led to it helps to prevent the same thing from happening again in our future. 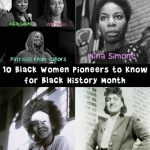 It is critical for all of us to learn these stories so we can nurture our sense of compassion and social responsibility. And also so that we can learn to recognize patterns in our society today that mimic the past so we can speak out and prevent such terrible events from happening once more. Elie Wiesel is one of the Holocaust survivors of Auschwitz. He has written more than 50 books, including “Night,” a work based on his experiences as a prisoner in the Auschwitz and Buchenwald concentration camps. In 1999, Wiesel addressed Congress as part of the Millennium Lecture series hosted by President Bill Clinton and First Lady Hillary Rodham Clinton. 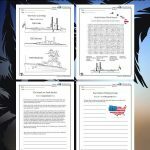 Have your students read or listen to his great speech. Below is a printable copy of this speech called The Perils of Indifference. 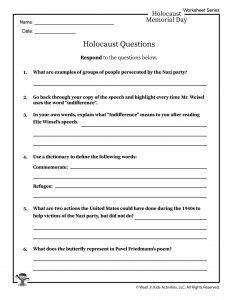 Activity: Ask your students to research Elie Wiesel. Since his imprisonment and release from Auschwitz, he has gone on to do many things. 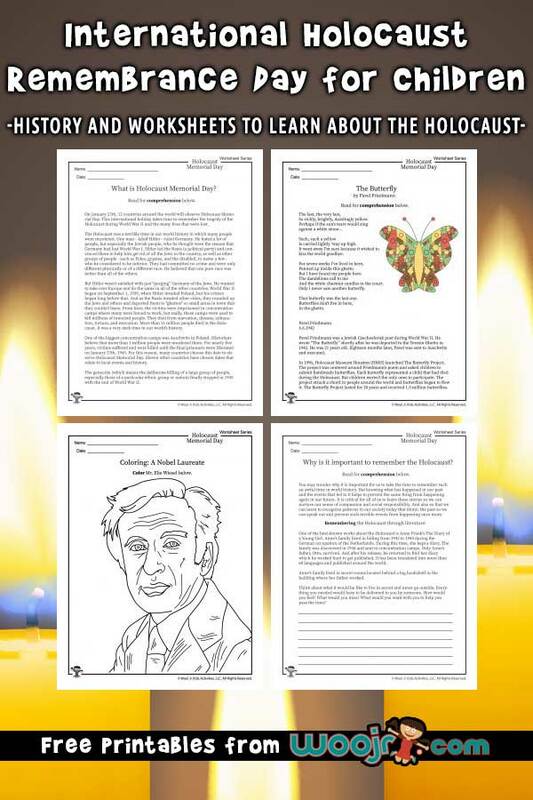 Ask your older students to create their own poster featuring Wiesel. 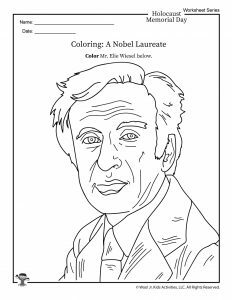 Print our coloring page of Elie Wiesel for younger students. Pavel Friedmann was a Jewish Czechoslovak poet during World War II. He wrote “The Butterfly” shortly after he was deported to the Terezin Ghetto in 1942. He was 21 years old. Eighteen months later, Pavel was sent to Auschwitz and executed. 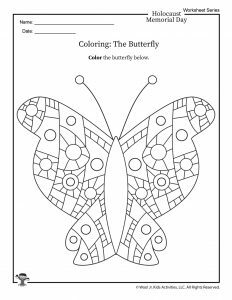 In 1996, Holocaust Museum Houston (HMH) launched The Butterfly Project. 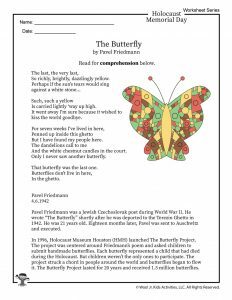 The project was centered around Friedmann’s poem and asked children to submit handmade butterflies. Each butterfly represented a child that had died during the Holocaust. But children weren’t the only ones to participate. The project struck a chord in people around the world and butterflies began to flow to it. The Butterfly Project lasted for 20 years and received 1.5 million butterflies. You can read more about this amazing project here. 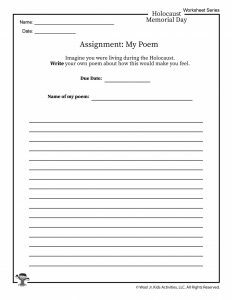 Activity: Download our blank poetry pages and have your students write poems in honor of the Holocaust victims, or print our butterfly coloring page for younger children. One of the best-known works about the Holocaust is Anne Frank’s The Diary of a Young Girl. Anne’s family lived in hiding from 1942 to 1944 during the German occupation of the Netherlands. During this time, she kept a diary. The family was discovered in 1944 and sent to concentration camps. Only Anne’s father, Otto, survived. And after his release, he returned to find her diary which he worked hard to get published. It has been translated into more than 60 languages and published around the world. There are many, many resources dedicated to Anne Frank and her book. One of the largest is Anne Frank House, a museum in Amsterdam. 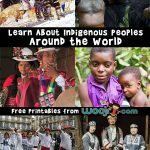 You can find lots of great information on their website’s education page. Activity: Anne’s family lived in secret rooms located behind a big bookshelf in the building where her father worked. Think about what it would be like to live in secret and never go outside. Everything you needed would have to be delivered to you by someone. How would you feel? What would you miss? What would you want with you to help you pass the time? 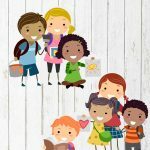 Monica Olivera is a homeschooling mother of two and a freelance education writer. 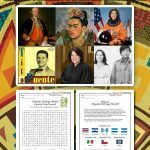 Her site, Mommy Maestra, helps Hispanic parents get more involved in their children's education by providing resources, tips, and opportunities.